It’s hard to watch All the Money in the World without being aware of what went on behind the scenes. The film originally starred Kevin Spacey in the role of J. Paul Getty, but following the sexual assault allegations that surfaced against him in November of last year, the choice was made to do extensive last minute reshoots and replace all of his scenes with Christopher Plummer in the role, despite a trailer having already been released. The fact that these reshoots were completed in under ten days, and the film was still able to keep its December release date, is impressive in and of itself. But what makes it even more impressive is how seamlessly Christopher Plummer fits into the film, so much so that it’s hard to even imagine anyone else in the role. Directed by Ridley Scott, the film takes place in 1973 and is based on the true story of what transpired after Getty’s grandson John Paul Getty III (Charlie Plummer) was kidnapped in Italy, and held for ransom. The boy’s mother Gail Harris (Michelle Williams) will do anything to get her son back, and tries appealing to her father-in-law to use the untold billions that he has made as an oil magnate to pay the ransom. But Getty is extremely reluctant to part with any of his money, despite being the richest man in the world at the time, instead deciding to put his own private security guard Fletcher Chace (Mark Wahlberg) on the case to try and negotiate with the kidnappers to release his grandson. The film becomes an interesting portrait of a man nearing the end of his life who values money and his worldly possessions more than his own grandson, and Christopher Plummer seems reinvigorated by the project, delivering a riveting portrayal of J. Paul Getty. It’s somewhat ironic that he was actually Ridley Scott’s first choice for the role, and it was the studio that wanted Kevin Spacey under heavily touted old age makeup, because they thought he would be a better box office draw. The Academy went on to honour Plummer with a Best Supporting Actor nomination, adding a nice bow on what was already a historic achievement. The film itself feels a little long, and the screenplay is overly expositionary at times, but this is still a decent hostage drama that is worth seeing for the solid performances. While it is almost impossible at this point to watch All the Money in the World without being aware of what went on behind the scenes, this is also a fascinating context within which to view the film, and in many ways it makes Christopher Plummer’s performance – and the movie around him – even more impressive. The Blu-ray also includes a selection of carefully trimmed deleted scenes and the three featurettes Ridley Scott: Crafting a Historical Thriller, Hostages to Fortune: The Cast and Recast, Reshot, Reclaimed, which focuses on the speedy reshoot process without ever mentioning Kevin Spacey by name. The most interesting thing about these featurettes is that they too would have needed to be reshot to include interviews with Christopher Plummer, and there is probably a second version of them somewhere featuring Spacey. 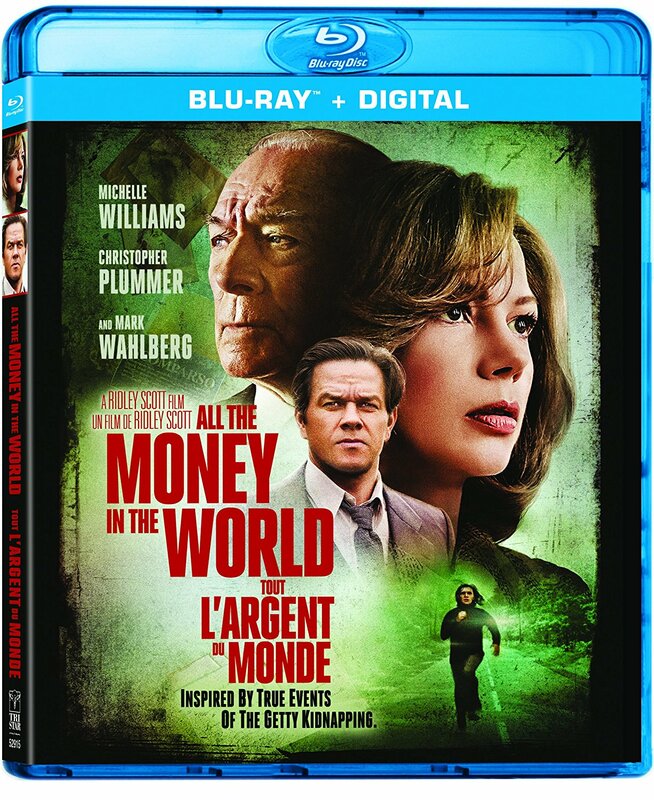 All the Money in the World is a Sony Home Entertainment release. It’s 133 minutes and rated 14A.